Viktor Krupskii was born on 21 December 1921 in Kremenchug and learned to fly in an aeroclub. 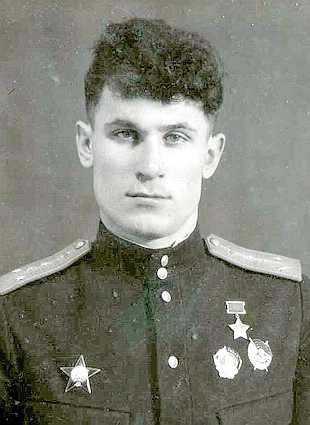 He joined the army in 1939 and attended the Chuguyevsk Military Air School from which he graduated in 1940. In July 1941, he was served in 147 IAP on the Karelian Front, flying I-153s. He was decorated with the Order of the Red Banner on 7 November 1941. In January 1942, he was transferred to the 760 IAP on the same front. This unit was equipped with Hurricanes. On 24 March 1942, he was promoted to flight commander. He was decorated with the Order of the Red Star on 1 May 1942. In December 1942, Starshii Leitenant Krupskii was transferred to 20 GIAP (this was his old 147 IAP which had become a Guards unit on 7 March 1942) where he commanded the 5th eskadrilia. This unit was equipped with Kittyhawks. On 22 February 1943, he was decorated with the Gold Star of the Hero of the Soviet Union (no. 897) and the Order of Lenin. He claimed a Bf 109 over Luostari airfield on 25 March 1943 before being shot down and seriously wounded. He was hospitalized and didn’t fly any combat missions after this. He left 20 GIAP in August 1944. Krupskii ended the war with 2 biplane victories and a total of 9. These were claimed on 330 sorties and 32 combats. During his career, he was also decorated with the Order of Patriotic War 1st Class (11 March 1985) and the Order of Patriotic War 2nd Class (13 November 1944). Krupskii was demobilized in 1946 as a Podpolkovnik. He passed away on 10 September 2000 and is buried in Orel. TOTAL: 9 and 10 shared destroyed.